Hand carved stone buildings are rare in Newfoundland. 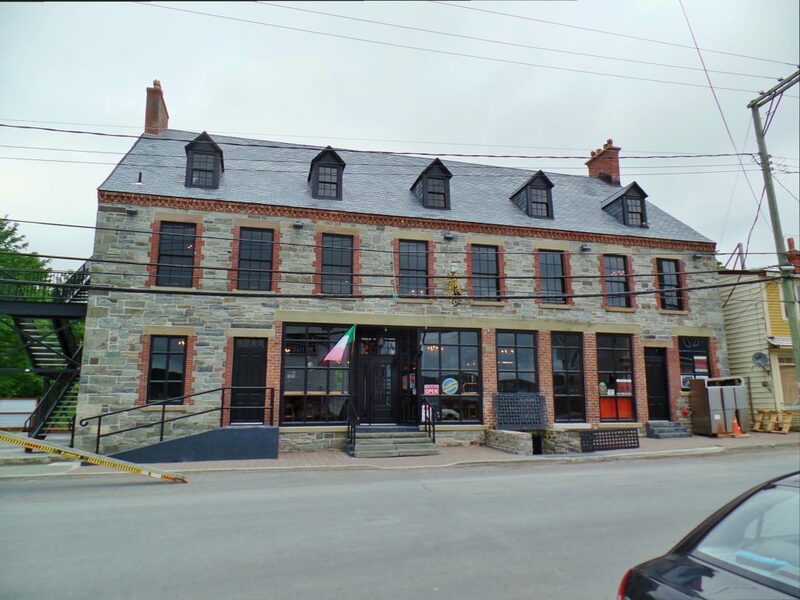 Carbonear has one of the oldest, a 160 year old structure that was originally the Rorke Mercantile Store. It was in a dilapidated state for a long time. Then in 2007 the Stone House (as it was known) was purchased by Bruce Brannon and things started looking up for this important part of our built heritage. In 2009 Brannon began a massive renovation of the entire building. Literally everything but the four stone walls of the building was removed. 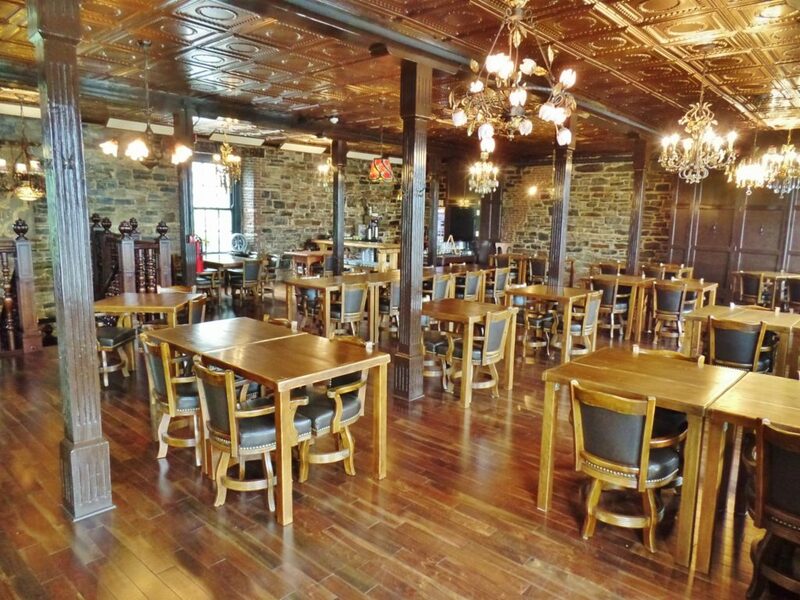 Painstaking work began to completely rebuild the interior of the Carbonear landmark. Brannon’s goal was to create a tasteful, attractive interior in keeping with the style of the building. The result, after five years of hard work (and some frustration, according to Brannon) is a lovingly rendered, brilliant reinvention of the 1860 structure where the smallest details have been perfectly executed. Even the swinging sign bearing the building’s new (and original) name, Stone Jug, is a work of art. A pirate skull and crossbones in black and gold, with clashing swords, is wreathed in a meandering vine of delicate coal black roses. Stone Jug’s three levels are connected by a beautiful period staircase fashioned from hardwood. Floors too are of dark hardwood. Ceilings have been finished to resemble the pressed metal or tin tile wall and ceiling coverings popular in the nineteenth century. Hanging at appropriate intervals throughout the building are glittering chandeliers, all imported from Europe and all different yet comparable in size and elegance. They bring energy and spirit to every quarter. 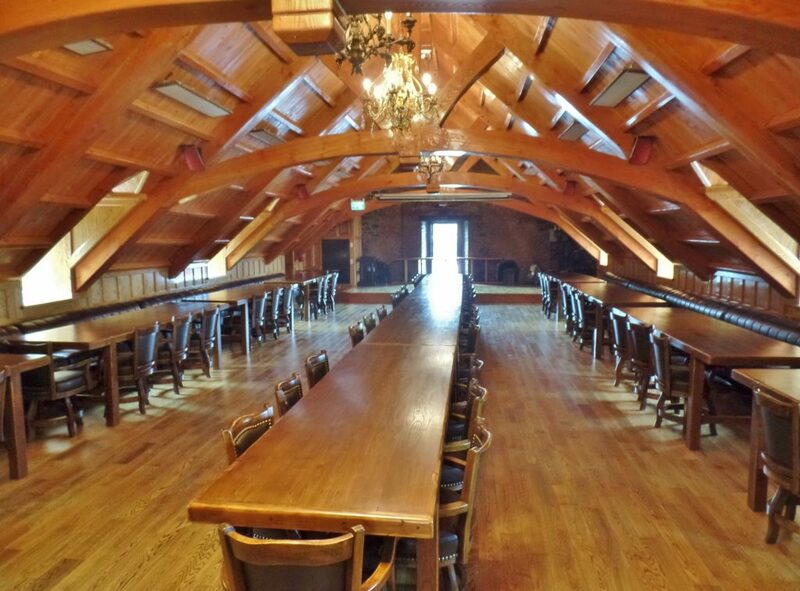 Most of Stone Jug’s tables and leather covered chairs, as well as the 85 foot bar that borders the open kitchen on the ground floor, were made from reclaimed wood from a building that Brannon bought in Russia. The furniture was then constructed at a factory he runs in China. Brannon, knowing nothing of Newfoundland, came here in 2007 as a translator for a group of Chinese investors. He speaks Mandarin, Cantonese, Russian, German and English. He was born in Russia (his mother was Russian) and grew up in Vienna, Austria. Educated at Stanford University (where he learned to speak perfect English) Brannon ended up working in China for much of his adult life. At the same time he has managed to pursue a passion for restoring old buildings. He’s also restored buildings in Vienna and Macau. When Brannon decided to open a restaurant in Stone Jug he reached out to Chef Steven Pynn, a Newfoundlander who spent 12 years working at Toronto’s famous Canoe, located at the top of the TD Bank Tower. 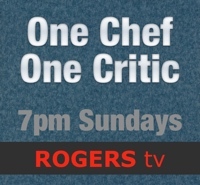 Pynn’s sous chef is Crystal Bourne who formerly worked at the Fairmont Banff Springs Hotel. Although Stone Jug’s dinner menu looked interesting (management told me that Pynn makes a mean baked cod) we visited in the afternoon before dinner was being served. Much of the menu is pub fare: burgers, BBQ, pizzas, deli style sandwiches and poutine (called Irish Poutine and with house curry sauce). 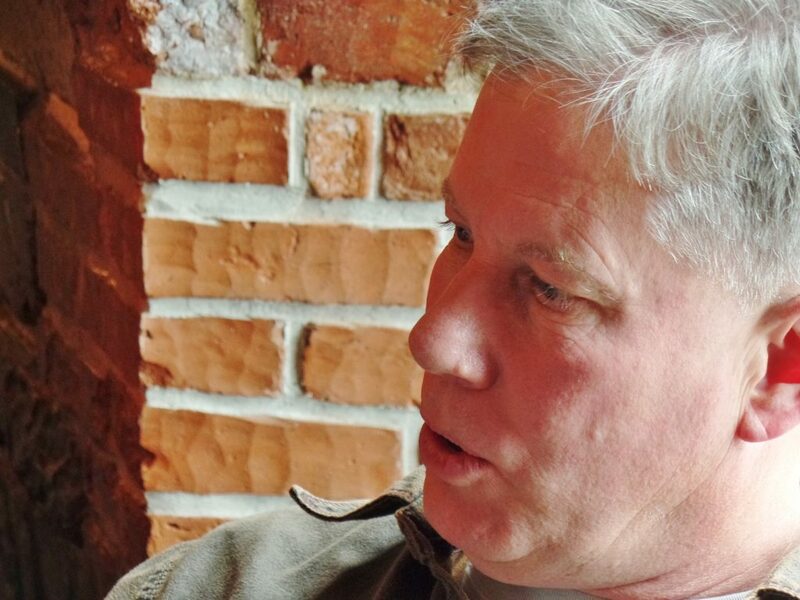 Owner Brannon and Chef Steven Pynn are both passionate about local ingredients. Twice a week Roots Country Farm of Bay Roberts delivers produce. Four Brothers Cheese is used in several dishes and an effort is being made to utilize local beef. 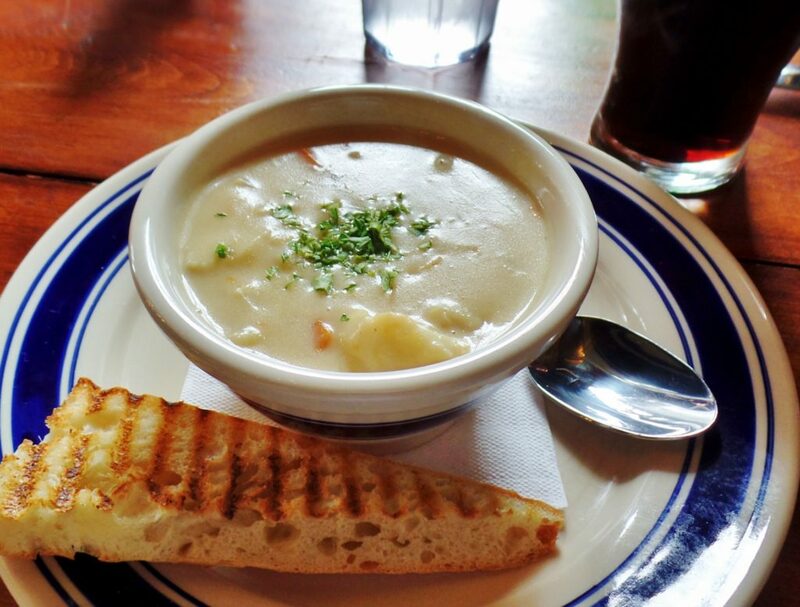 Seafood chowder, called “Round da Bay Chowder” was a traditional dairy based stew. Thickened liquid tasting of the sea surrounded pieces of cod, shellfish and other tender seafood. Joined by a slice of grilled bread and glass of white wine it got even better. Of course, a good tasting snack or appetizer makes you hungry for more, more of the same or for more food. Stone Jug makes a very credible Reuben. 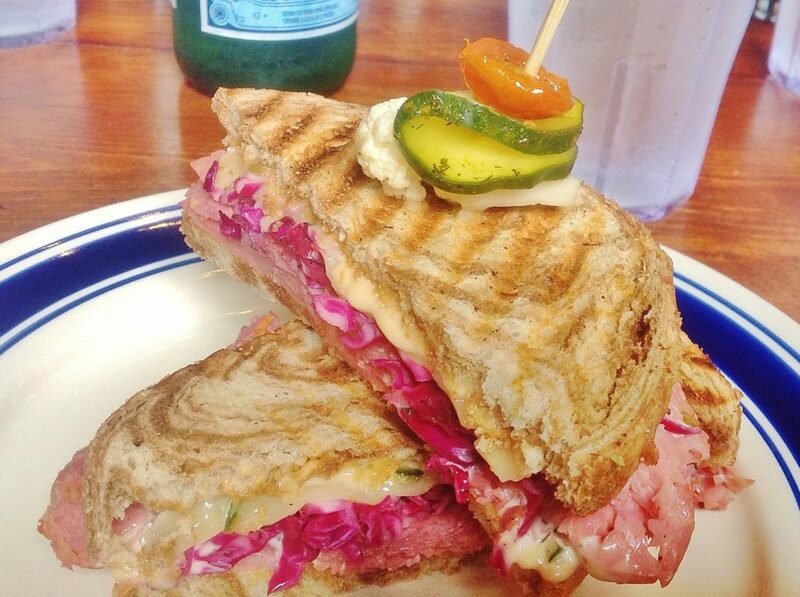 Grilled rye bread held together juicy, pink smoked meat, red cabbage sauerkraut, Swiss cheese and Thousand Island sauce. Just listing those ingredients makes me hungry, especially for smoked meat. And, it all comes down to the quality of the smoked meat and the amount of it. Stone Jug’s Reuben had the quality but missed (by a smidgeon) on quantity. 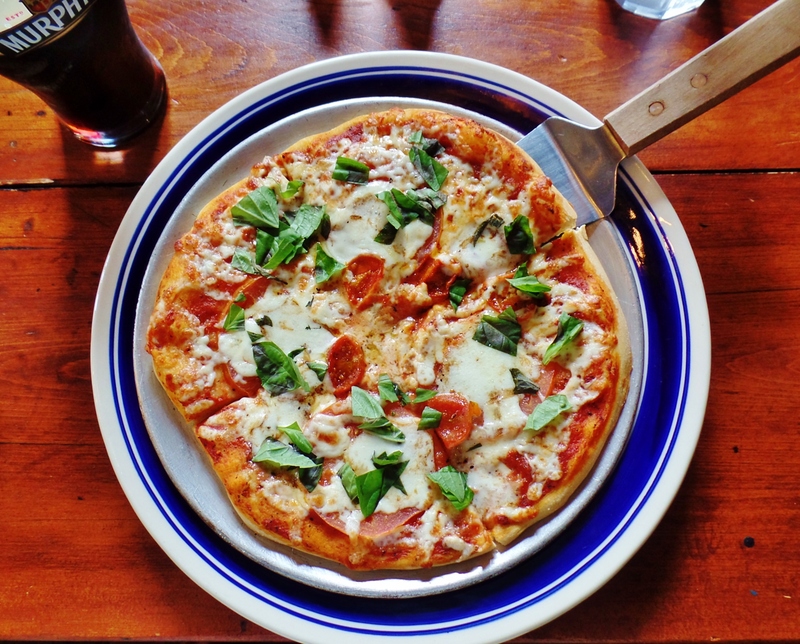 When my Margherita pizza was placed before me I immediately thought of the cover of Bon Appétit or Saveur magazine. It could have graced the cover of either, with no photo-shopping required. The personal size, thin crust pizza was covered in tomato sauce, mozzarella (and possibly Parmesan or other cheeses) sliced tomato, fresh basil and drizzle of olive oil. It tasted as good as you’re probably thinking it did. 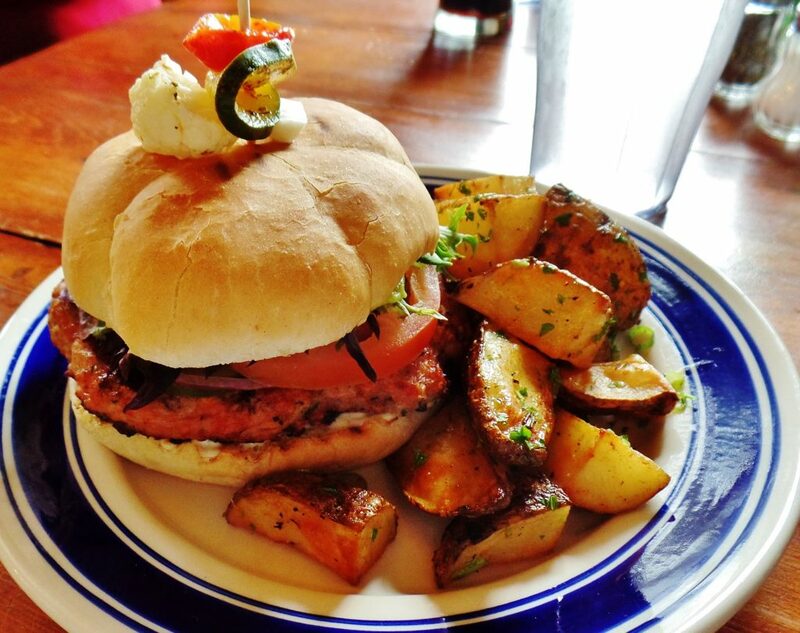 Lean and juicy ground turkey formed into a generous patty was the star of Stone Jug’s turkey burger. It had just enough of that smoky taste of char to make it taste adventurous. Pickle mayo, guacamole and cranberry condiments made me entirely forget about ketchup and mustard. Excellent potato wedges, spiced and roasted, made a cheerful partner and welcome change from fries. 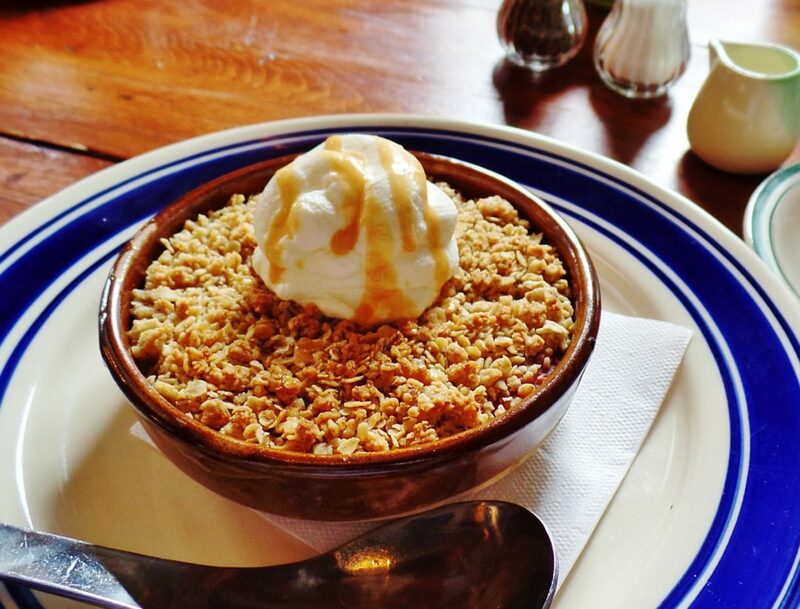 Fruit crisps and bread puddings are staple desserts in Newfoundland and restaurants like Stone Jug are right to serve them. 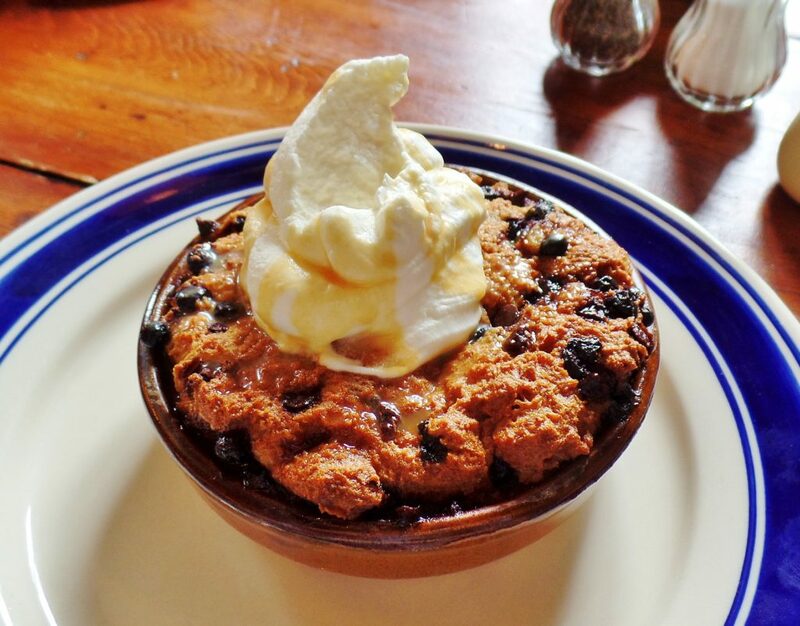 We tried a rhubarb crisp and Stone Jug’s chocolate blueberry bread pudding. Both were delicious. The chocolate competed a little too much with the blueberries but the rhubarb was tart and bright. He’s lived in Newfoundland since 2014 but still isn’t sure this is where he wants to settle permanently. Though, he did admit (smiling) that he’s purchased a house in a secluded area overlooking Conception Bay. Whether it turns out to be a permanent or part-time abode, let’s hope Bruce Brannon’s Stone Jug remains a thriving business in Carbonear. It’s wonderful. Price A lunch for two with appetizers, wine, tax and tip costs approximately $85. 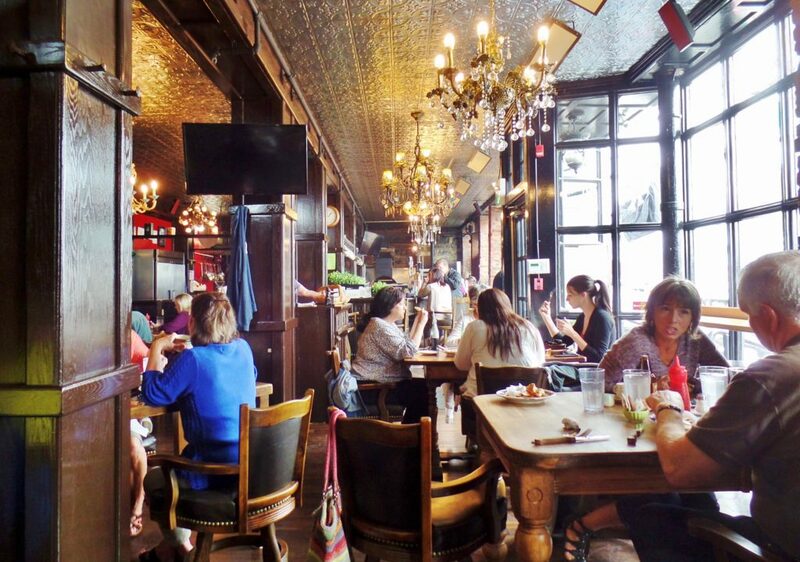 Ambiance Like being inside an elegant, Old World pub. Open Wednesday and Thursday: 11:30 a.m. to 10:30 p.m. Friday and Saturday: 11:30 a.m. to 12:30 a.m. Sunday: 10:30 a.m. to 10:30 p.m. Parking Street and parking lot. Beverages A small wine selection includes three whites and three reds: Chardonnay, Pinot Grigio, Sauvignon Blanc, Merlot, Sangiovese and Zinfandel. Wines can be purchased in a standard pour, large pour or by the bottle. Beers come on tap or by the bottle. Tap beers include choices like India Lager, Creemore Premium Lager and Murphy’s Stout. Bottled choices include Coors Lite, Black Horse, Corona, Tankhouse Ale, Barking Squirrel Lager and many more. A wide range of spirits and liqueurs is also available. Wheelchair access The Stone Jug is not wheelchair accessible.